Before you contact us, in this section you’ll find answers to the most Frequently Asked Questions we receive. Shipment takes 5-21 working days with the italian post service Poste Italiane. It is shipped every week on Friday. If you choose DHL it will arrive within 48 hours. Note: we do not take responsibility for incorrect or incomplete addresses. If you choose DHL we will mail you your tracking code the same day we ship your order. The shipping method flat rate is without tracking code. 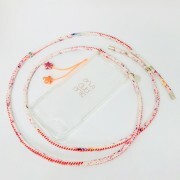 Do you do necklaces for other companies than Apple? No, until next year we only use iPhone covers. Do you offer personalization of a product? No. Only in model N°006 in silver you can decide the letter on the letter bead. When or within 12 hours after ordering you have to send us an email to service@blueandtrue.com, that you need an invoice instead of the usual packing slip. Unfortunately it is not possible to write an invoice later. How do I pay with credit card via PayPal? 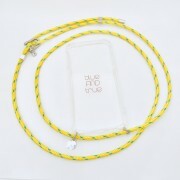 We do not sell the iPhone necklace without the cover or the cover without the necklace. The product has to be unused and in the original packaging. Please make sure to insert INSIDE the envelope all important information such as order number, address, reasons for sending it back. Shipments without this information inside can not be proceeded. We will refund you by arrival. Please contact us to service@blueandtrue.com and evtl send us pictures of the damage. Guarantee is up to 6 months. Evtl we will pay for your expenses. Please make sure to insert INSIDE the envelope all important information such as order number, address, reasons for sending it back. We will repair or replace damaged parts. 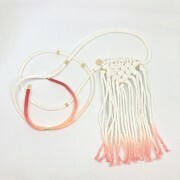 Please be aware that the necklaces are handmade, partly hand dyed or embroidered and will show signs of use after some weeks or months, which is out of our control and for which we don’t take responsibility. How long does my shipment take? Can I reserve a model wich is out of stock? Usually a necklace model is out of stock for maximum 2 weeks. If not reported on the product page, products can not be reserved. The product I want is out of stock, when will it be back? I have a Samsung / Google Pixel / Huawei / etc. Until next year we only use iPhone covers. We don’t take responsibility for damaged or lost phones. Please always check the condition of your cover and that your phone sits and fits properly in the cover at all time. Placed orders can only be changed within 2 hours after placement. We use real leather with supposed to get a vintage look after a while. please treat it with hand cream from time to time. It will thank you…..